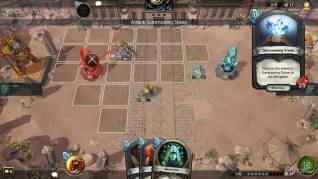 We took some time to check out Hand of the Gods: SMITE Tactics, the new game from Hi-Rez Studios (SMITE), a free to play turn based strategy title with elements from the CCG genre. Currently in its Beta phase, players are now able to sign up for free (whether this is temporary or permanent we’re not sure) and get access to the game. 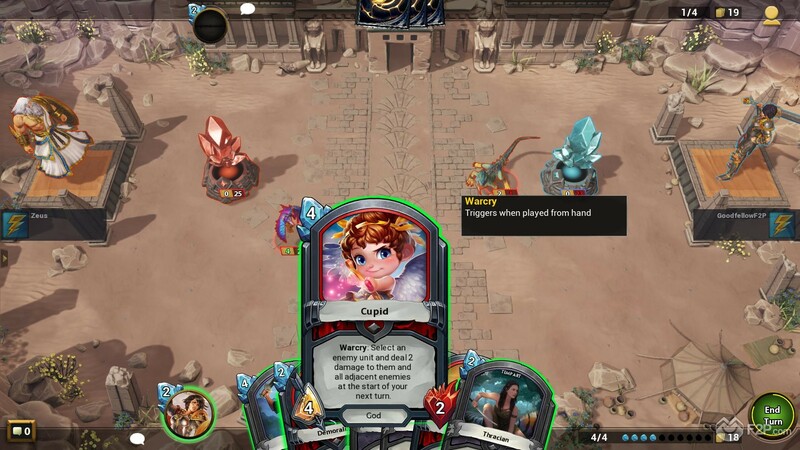 Based on the same deities and mythologies we’ve seen in their third person MOBA SMITE, Hand of the Gods is a twist on the typical CCG genre. In the game players build up decks of cards using the various pantheons of Gods, heroes and units themed to that pantheon (ie. the Greeks, Egyptians, Norse, etc.). This element of the game is fairly typical of most CCGs, with hundreds of cards available, with some exclusive to a specific pantheon and then a bunch of Neutrals that can be used in any deck. Decks consist of 25 cards, no more than 2 of the same card per deck, and are broken down into classic Item (Spell) cards or Unit cards in the shape of Minions or more powerful God cards. As well as this each deck begins with its Leader card that determines the special ability that Leader/deck can use in a turn. 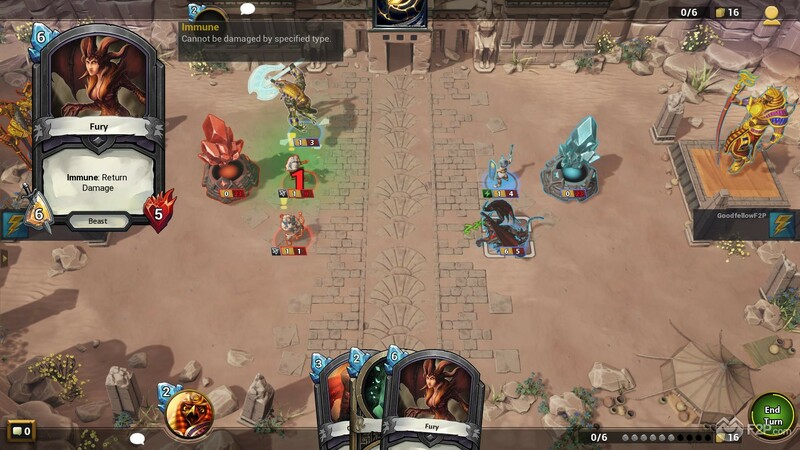 Into the game not much strays from the CCG gameplay initially; players draw cards into their hand and accrue one extra mana each round as well as replenishing all mana spent on playing cards in previous rounds. Now things get a little bit different. When playing a unit card (minion or god) they are placed down onto the gridded battlemap and take a physical position. 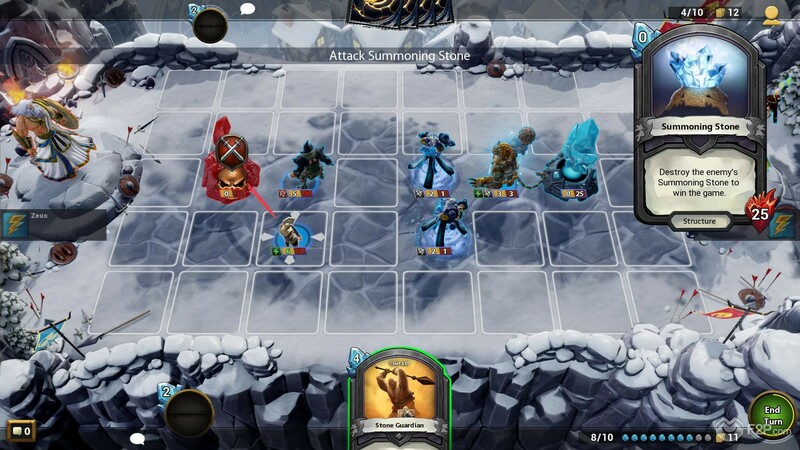 Each minion has an attack and HP score as normal with a CCG, but they are moved around the board like pieces on a chess board, attacking other units. Ultimately the objective is to destroy the enemies Summoning Stone, a 25hp structure on the other side of the map, and simultaneously try and defend your own structure. We had access to 5 pre-built decks, with the sixth Ah Puch god and the Mayan pantheon being one we could create for ourselves. There’s lots of cards, lots of options, and the 25 card limit is actually very newbie friendly. So many CCGs have much higher caps and it can feel a little difficult to build a deck early on because there’s so many cards to look over; 25 is a pretty solid number for new players, but might be a little short for veterans. All that said the 25 cards are justified as the games are generally pretty quick and in the dozen we played we never hit the end of our deck once. 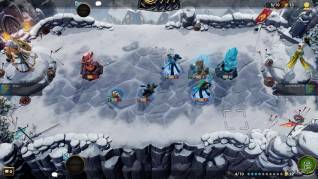 Units are placed and killed off just as quickly, and many times it did feel quite snowball that once you had a few extra units on the battlefield than your opponent then it seemed quite difficult for them to recover. Graphically the game is decent enough, not too demanding but keeping it simple. There’s a relatively decent pool of cards to choose from and six primary pantheons to build a deck out of currently. 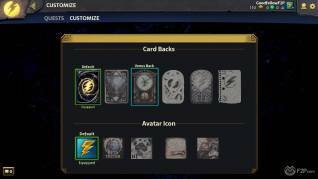 Earning currency seems quite quick and purchasing new card packs to increase our collection wasn’t too hard. All in all a fairly solid game. So what’s our problem? It’s not that we don’t like Hand of the Gods, it’s more that we don’t really see the point. There’s not really anything new to the CCG meets chess/board-game strategy. 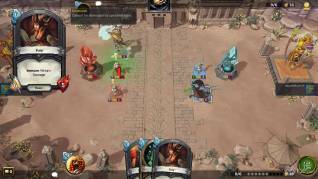 We’ve already seen it in titles such as Duelyst which was released 2 years ago and is essentially the same type of gameplay. 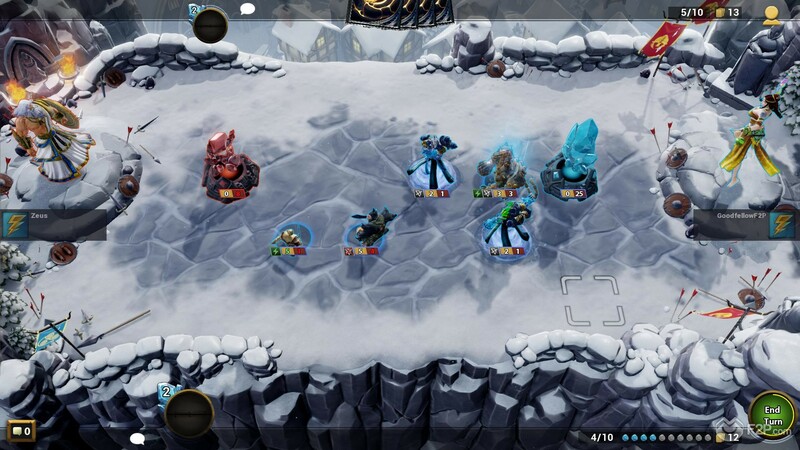 Krosmaga has a deck building with units being placed on a battlefield, albeit you have no control over them and they move automatically. 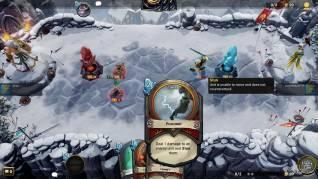 Faeria also saw deck building meets board strategy, but with some really unique land changing mechanics that added a much deeper level of strategy. Hand of the Gods feels like it’s the bare bones of a title, with simple, solid and pretty unoriginal mechanics. 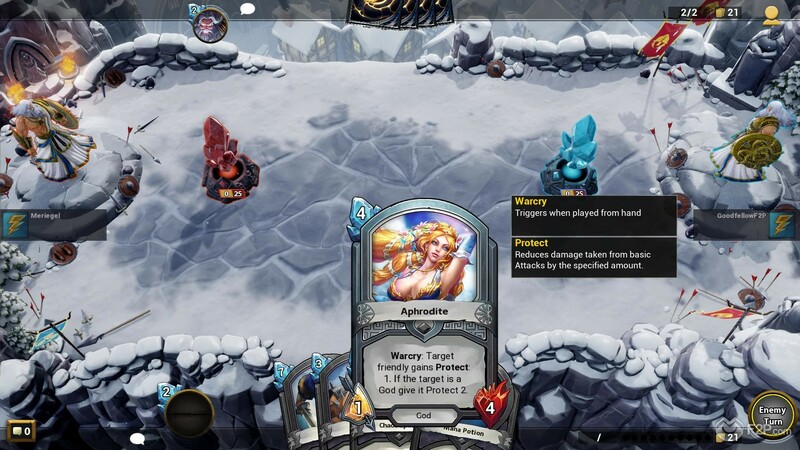 Added to this is the ability to disenchant unwanted cards and turn them into resources then used to create new cards. In some other card games you can’t simply make any card you want and it has to be a duplicate of one you already own, in Hand of the Gods you can just make any card that you want. The result, in our opinion, is going to be a bunch of cookie cutter template decks that are easy enough to make due to the crafting. Ultimately the game is decent, we enjoyed playing it, but all the time we knew there were better/more complex and tactical similar titles out there. The crossover of the Smite brand into two different genres definitely has that Blizzard feel to it with Heroes of the Storm using IP from their various franchises, and (rightly or wrongly) many would say Heroes of the Storm is very casual. 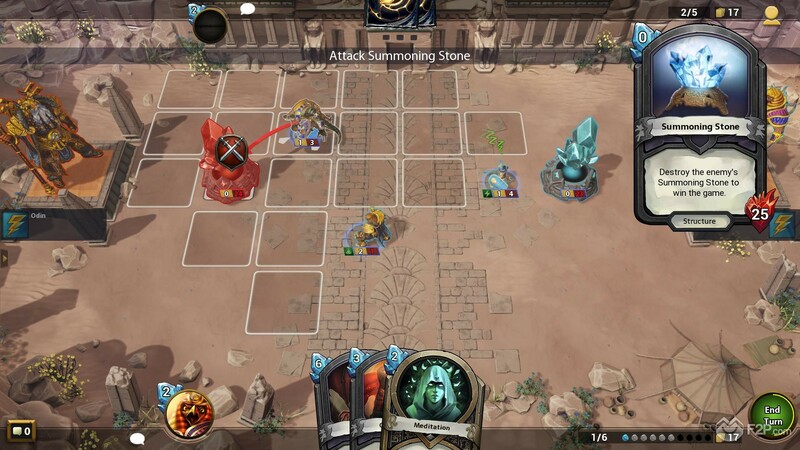 However, there are levels of complexity to Heroes of the Storm and if Hi-Rez are trying to do the same with Hand of the Gods as their casual CCG-board game strategy then they’ve missed those hidden depths and nuances that are greatly needed.